← Long Flights – Staying healthy, getting comfortable and keeping your back in tact. Bunions: occur when the big toe bone is misaligned, which can lead to extra bone growth or the growth of the fluid-filled sac at the base of the toe. Bunions can cause redness, swelling, calluses and corns, soreness, and/or pain. Conventional treatment involves avoiding tight, pointed shoes, or accommodating the bunion with felt padding, or by cutting out a hole in the shoe. In severe cases, surgery is required, in the form of a bunionectomy. **One cause of bunions is inappropriate weight distribution, with poor posture forcing too much of your weight onto the front inner part of the foot. Proper leg and foot alignment that reduces excessive weight over the bunion area can help prevent and even treat bunions. Calluses and Corns: consist of thick, hardened skin appearing on the feet (or occasionally hands) as a result of pressure or friction. They may provide useful information about where the weight of your body is falling over the feet. You may reduce the discomfort with corn plasters, orthotics, or even by getting the callus or corn scraped off. ** By adjusting the pattern of weight distribution on the feet. This will not only help prevent calluses and corns, but may also help prevent or address other musculo-skeletal problems. Flat Feet: occur when your foot loses its arch. Normally, they are treated with various orthotics, wedges or arch supports. In other words, under the traditional approach, you are encouraged to find ways to live with the condition. **Rather than adapting to your flat feet, you can work towards altering problematic foot structure. By redistributing most of your body weight over their heels rather than over the front of your feet, strengthening critical muscles in the feet, and walking in a way that builds up muscles in the foot arch. 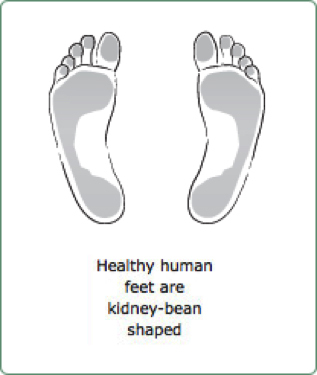 Insoles can help and can be easily upgraded as the foot structure improves. Morton’s Neuroma: is the result of a pinched nerve in the foot, causing a tissue buildup (called a neuroma) around the nerve. Pain is often felt between the third and fourth toes of the foot. Wide shoes, foot padding, oral medications, and cortisone injections may help. Surgery to remove the neuroma is occasionally recommended. **The body is designed to build up bone and other tissue where there is continual stress. In the case of Morton’s Neuroma, this build-up is unhappily adjacent to a nerve, and therefore causes significant pain. A solution is to relieve stress on that portion of the foot when standing and walking – learning to carry your weight mainly over the heels, which are the sturdiest parts of the feet, rather than over the more delicate balls and arches. Plantar Fasciitis: is inflammation of the thick tissue bridging the arches on the bottom of the feet. The plantar fascia has limited elasticity and is not constructed to take a significant portion of the body’s weight. If it is overstretched it can become inflamed or even torn. People carrying excess weight and pregnant women are especially at risk of the inflammation, which can cause severe heel pain. This may be especially notable after exercising or when you get out of bed in the morning. The pain is usually mild at first, but increases over time if left untreated. Rest, cold therapy, pain relievers (NSAIDS), orthotics, and stretching exercises may help. If they don’t, your doctor may prescribe injections of corticosteroids, or in rare cases, surgery. **When we evolved from being Quadra pedal to bipedal, the foot changed significantly. We developed a much sturdier heel bone. The bones in the front of our feet are relatively delicate. The heel bone is constructed for weight bearing. We are designed to stand with our weight primarily on our heels. Exercises to strengthen the foot: 1. Grab the Towel- Put a hand towel on the floor using just your foot, gather the towel under your foot using toes and arches. 2. Grab the Ball. Place a small ball on the floor. (25mm or so) Try to grab the ball with one foot. You may initially only be able to grab it with your toes. As your arches grow stronger you may be able to grab the ball under your transverse arch. You can then move to larger balls. I am a massage therapist and Gokhale Method® Teacher I do Hawaiian Lomi Lomi Massage simply for this reason- "It is the most relaxing massage that I have ever received and in turn, it is what I want to share with others." Lomi Lomi involves long rhythmic strokes as well as deep work relaxing the body, mind and spirit on all levels. I thoroughly love giving this massage. I am also a Gokhale Method Teacher. This method is based on the Book "8 Steps to a Pain Free Back" by Esther Gokhale. 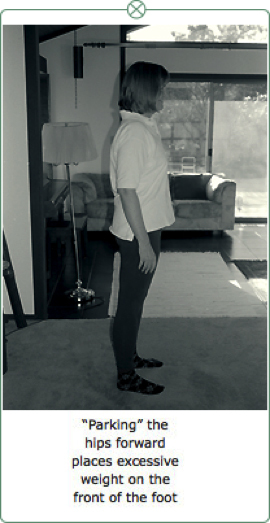 Primal Posture™ and alignment for Pain-Free living. After discovering this method for myself, it wasn't enough for me to just do massage. I wanted to teach people how they could help themselves when they are off of my table. Many of my clients suffer from chronic or acute pain. It is one thing for me to help people by applying external forces. But it is another to help empower them to help themselves lead a pain-free life 24/7. The Gokhale Method® teaches you how to lengthen strengthen and align your body enabling a pain-free life everyday! It doesn't involve a lot of exercises or gadgets. It incorporates improved movements that you use while sitting, standing, sleeping and walking. Doing daily movements in a way that promotes health and well being as opposed to promoting arthritic conditions, disc degeneration or worse. It is based on posture that you had as a little kid, on cultures where people don't experience back pain and on our ancestors. It is old/new information that we have forgotten how to use put together in an easy to follow, comprehensive way. Gokhale Method inspires you to think that there is something you can do for yourself to help treat your symptoms of pain. I encourage you to look into it further on www.gokhalemethod.com or contact me with any questions. This entry was posted in Gokhale Method, Health & Well Being, Massage and tagged Alignment, Back Pain, Foot exercises, Foot problems, Posture. Bookmark the permalink.